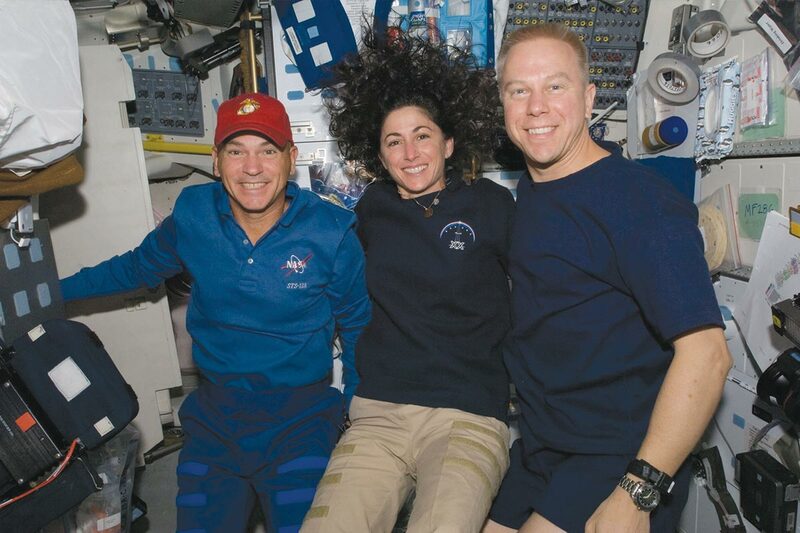 In 2009, Nicole Stott ’92 spent 91 days in space, which gave her a new perspective on life. Now she wants to share it with the world through art. 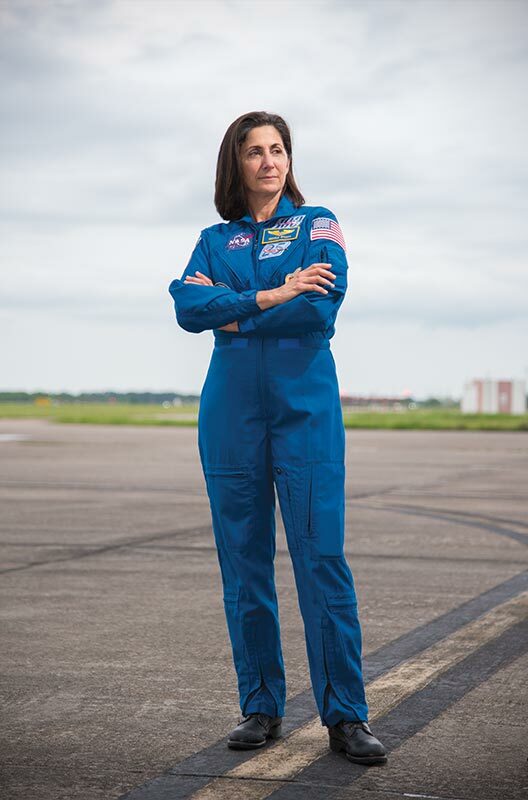 Nicole Stott ’92 has been on this planet for a little over 19,000 days — and off it for 104, in two space shuttles and a three-month stay on the International Space Station. She’s one of 533 people to enter Earth’s orbit and the 52nd woman to do so — and the 10th woman to perform a spacewalk. Stott doesn’t dwell on her place in history. But the enormity of what she accomplished — the decades of preparation, the fearlessness of riding a rocket into the sky at more than 25,000 mph, and the six hours and 35 minutes spent in the vacuum of space, with only a bulky spacesuit and a thin white tether protecting her from the starlit abyss — stays with her. But when she was in space, the surrealism wasn’t as daunting; the focus was on the specific, nitty-gritty objectives of each particular mission: fix this thing, check on that thing, make sure this other thing is running properly. Stott, like most astronauts, can talk for hours about the technical minutia that goes into keeping a football-field-size station operating while hurtling through space at 17,500 mph. She was alone in a literal sense, floating more than 200 miles above the Earth, far removed from life on terra firma. But from such great heights, you also see that indescribably beautiful blue marble, set against the blackest black, differently. The distinctions that drive so much conflict — race, class, religion and ideology — are no longer visible. “You realize you’re not from Florida or the United States. You’re an earthling. The bottom line is we are all earthlings,” Stott says. So last year, when Stott retired from NASA after 27 years, she decided that conveying this sense of awe and wonder was her new mission. And she does this with a brush and canvas, creating paintings that portray what it’s like to live and work in space and offer a sense of our place in the grand scope of the cosmos. And if you think about it that way, she says, perhaps you’ll take better care of it. Her first flight, aboard Discovery STS-128 — STS-128, meaning the 128th space shuttle mission — blasted off from Kennedy Space Center at 11:59 p.m. on August 28, 2009. There were seven crew members; Stott was the only woman. Stott and mission specialist Tim Kopra pose for a photo on Discovery while docked at the ISS. While the astronaut class of 2013 had as many men as women, Stott’s class in 2000 had 14 males and only three females; all three were classified as mission specialists, not pilots. This wasn’t uncommon. As Amy Foster, a UCF associate professor of history who has studied women in space, points out, many of the pilots are drawn from the male-dominated Air Force. The women, on the other hand, tend to come up through the science and engineering fields, like Stott did. And — at least at the dawn of the 21st century — they stood out. Stott’s path began in Clearwater, Florida. Like most children of her generation, she watched the Apollo missions and the moon landing. She thought being an astronaut was cool, but it seemed far removed from her reality. Airplanes interested her more; her father flew them. She didn’t want to be a pilot, at least not as a vocation. She wanted instead to become an engineer. She earned her private pilot’s license and attended Embry-Riddle, earning a B.S. in aeronautical engineering in 1987. She soon got her first job with NASA, as an operations engineer at Kennedy Space Center (KSC). Over the next decade, she held a number of positions at KSC and went to grad school, earning a master’s degree in engineering management from UCF in 1992, which she says was “like the icing on the cake, preparing me for what I wanted to do with the astronaut office.” She started to realize that going into space didn’t seem so far-fetched. So in 1998, she applied for the astronaut program. Two years later, she was accepted. NASA officials told her class it would take about six years for them to get into space. In reality, it took nine as NASA assessed the loss of Columbia and its crew. In the meantime, Stott spent 18 days in 2006 living underwater as part of NASA’s Extreme Environment Mission Operations program, earning the title of aquanaut and claiming the women’s world record for saturation diving. But fly she did, as did all 17 members of her class. And like most of them, she went to space twice. The first time, she spent three months on the International Space Station, where she performed maintenance tasks, did a spacewalk, assisted with research activities, and helped track and capture a Japanese cargo vehicle. On the space station, Stott says, astronauts’ days are planned from the ground, sometimes down to 5- or 10-minute increments: when to wake up, when to eat, daily tasks, the occasional moment of free time and, finally, sleep. 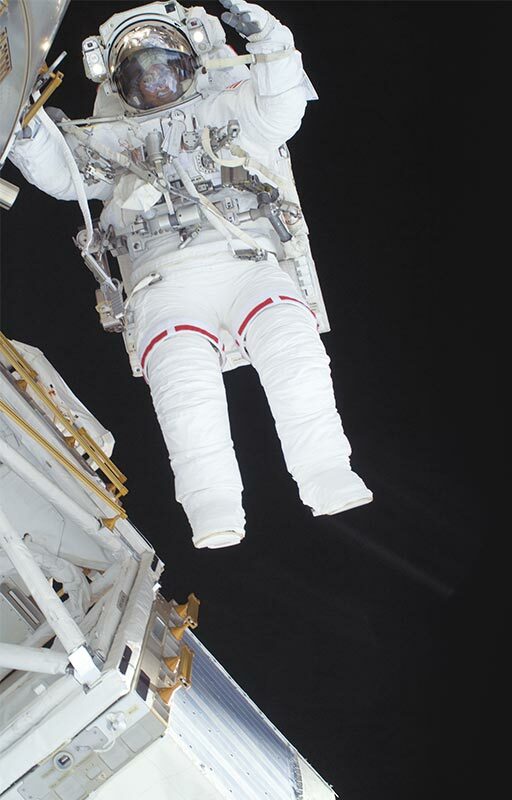 But one day was more different than the others: September 1, 2009, her spacewalk. Her prep for the spacewalk began the day before with a deliberate process to remove nitrogen from the body since, like divers, spacewalkers are at risk of getting the bends. Just before the walk came another elaborate process: getting suited up. After that, the airlock was completely depressurized, and the hatch opened. She was in the void. She and fellow spacewalker Danny Olivas had a couple of jobs that day. They had to remove a massive old ammonia tank and attach it to the station’s robotic arm. They also retrieved a technology experiment to be returned to Earth. Stott rode on the robotic arm for 20 minutes, holding the bulky tank in her hands. “I felt like I was standing on the floor,” she says, “and everything else was moving around me.” It was very peaceful, almost Zen-like — I could nap here, she thought to herself. “You don’t want to do that,” she adds. During her stay, Stott did two things that no one else had ever done. She was the first person to paint in space. And about halfway through her tenure, Stott co-hosted the first live NASA “tweetup” from the station, interacting with Twitter followers at NASA headquarters in Washington, D.C.
Stott had a knack for this sort of public relations, says Michael Barratt, who overlapped with Stott on the station for three weeks. She is “intense and really bright but also warm and affable. She could have been my long-lost sister, kidnapped by gypsies,” Barratt says. Before she went into space, Stott remembers listening to the former Apollo astronauts, the guys who went to the moon, talk about seeing Earth from up there. The word she kept hearing was insignificant — as in, humanity and our little planet seem very small in this grandest scheme of things. That wasn’t how she felt at all amidst the stars; she felt awed. Think about it: If the Earth was a little closer or farther from the sun, if the ionosphere and magnetosphere were not there to stave off solar flares, if the atmosphere wasn’t able to fend off X-rays and gamma rays, life here could never have emerged or evolved. None of what we know — our histories, our civilizations, our very consciousness — would exist. We hit the cosmic jackpot. That new adventure was her art. She’d painted before; in fact, she’d grown up doing artsy-craftsy things like woodworking and painting Christmas cards. Before her first journey to space, she decided she wanted to do something creative while there, so she brought a small watercolor kit. In 2009, Stott completed the first painting done in space. The Wave is based on a photo taken through the window of the ISS. 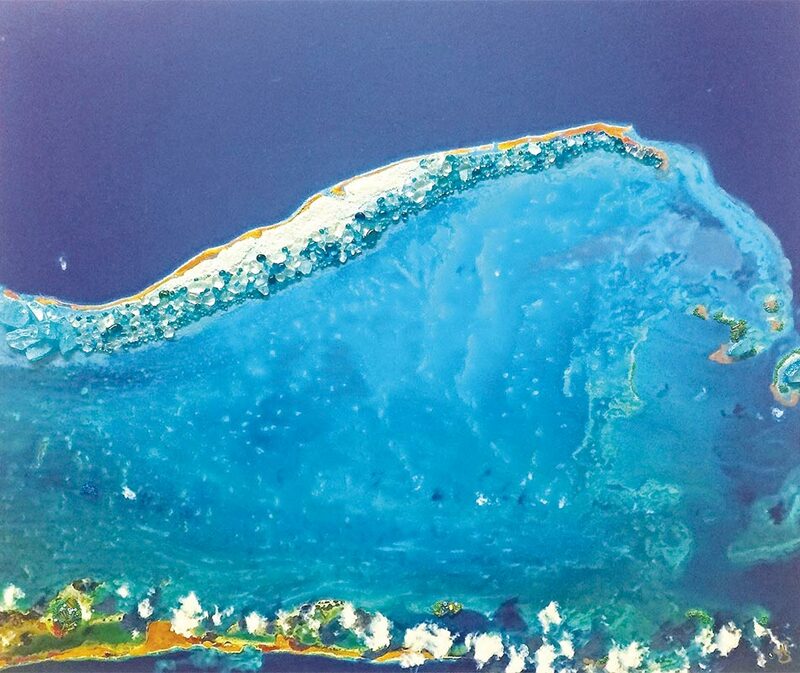 She has since created a mixed media piece (right) based on the same photo of the Los Roques archipelago in Venezuela. 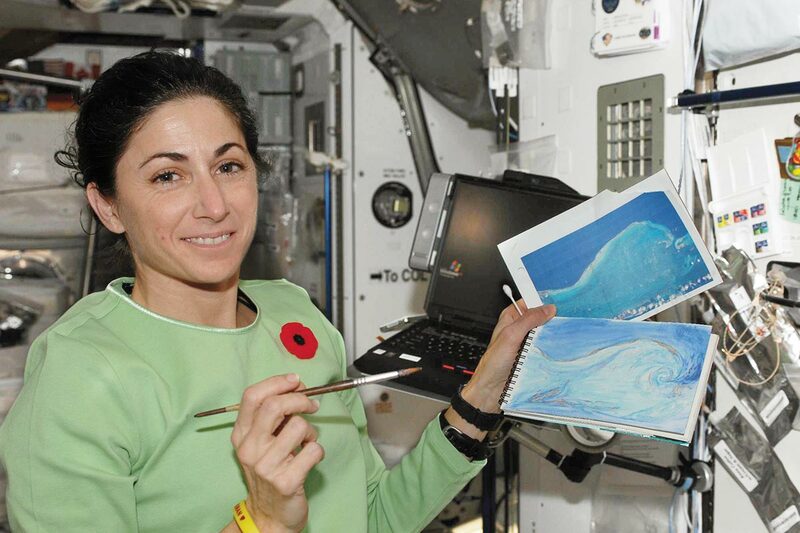 Her first painting in space — the first painting in space, made on the space station in 2009 — was a watercolor called The Wave, based on a picture she took from space of the Los Roques chain of islands, off the northern coast of Venezuela. To keep the paint from floating away, she dipped her brush into a drop of water before dipping it into the dry paint. The result was an image as seen from space, a thin stretch of green land jutting into a blue ocean. “I wanted to find a way that would allow me to creatively express the experiences I’ve had,” she says. In that vein, last year Stott was one of several astronauts who participated in a video message delivered to the diplomats gathered at the Paris climate conference, calling on them to act now to save the planet’s future. And, as a speaker who visits schools all over the country, she also wants to inspire kids to do what she’s done in her second career: Blend art with science. The acronym is “STEAM,” a play on STEM (science, technology, engineering and math) with an “A” for “art” thrown in. Similarly, she says, her time in space has made her fonder of science fiction. At its best, Stott says, sci-fi is a combination of artistry and science that tickles our imaginations and expands the boundaries of what we conceive as possible. Jeffrey Billman ’01 ’10MA graduated from UCF with a B.A. in journalism and an M.A. in political science. He is currently the editor in chief of INDY Week in Raleigh-Durham, North Carolina.